Grounding is reconnecting to the Earth’s subtle energy by walking or running barefoot on the ground. The first human beings walk and slept on the Earths surface soaking in all of her natural healing energy. In our civilized, modern world we have become disconnected by living indoors and wearing rubber shoes which prevent our feet from absorbing the negatively charged electrons from Earths surface. Standing on the Earths surface (Earthing) is the quickest and most effective way to ground ourselves. In his book “Earthing, Dr. Stephen Sinatra considers Earthing one of the most important health discovery ever. He demonstrates that emerging science reveals that direct contact with the ground allows you to receive an “energy infusion.” Dr. Sinatra stresses that this Earth energy can restore and stabilize the bioelectrical circuitry that governs your physiology and organs, harmonize your basic biological rhythms, boost self-healing mechanism, reduce inflammation and pain, and improve your sleep and feeling of calmness. I remember running barefoot as a kid, especially in the summer, yet somehow as an adult I rarely take my shoes off outside. Think back to the last time you went barefoot on the grass, dirt, sand, or gravel? My friend Karl recently asked his sister when the last time she was barefoot outside. She replied 10 years ago! (She lives in a high-rise apartment in New York City) It is no surprise that experts are saying kids and adults need to get out in nature more often. It is said that ones stress and anxiety levels begin to drop immediately within minutes of being in nature. So how do we ground ourselves? Here is a grounding exercise that works for me. Ultimately you want to be standing with bare feet outside on the ground. If that is not available, close your eyes and visualize yourself outside as you repeat these words. I place my bare feet firmly on Mother Earth (Gaia) at this time. I now imagine roots growing from the bottom of my feet and traveling deep into the core of Gaia. I ask Gaia to please send her healing energy to me. I visualize this energy entering these roots and traveling into my body. I feel a warm sensation enter my feet and travel up slowly into my ankles, calves, thighs and hips. This energy continues filling every part of my body including all of my organs, traveling to the very top of my head. Every cell of my body is now filled with this grounding, healing, earth energy. (You might feel a warm, tingling sensation). Stand in this space for as long as you need. When you are finished, thank Gaia for this blessing. 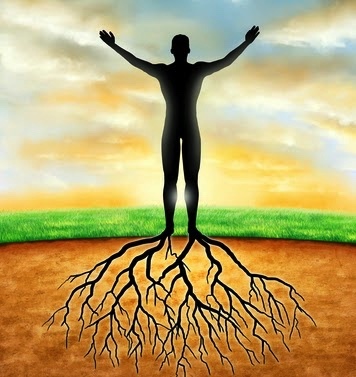 Thank you so much for reminding us about the importance and amazing benefits of GROUNDING. I am so thankful for your newsletters and I am looking forward to connect with my angels. Well….I am going outside right now ..barefooted… and so ready to feel the connection with Mother Earth and be blessed with Divine Healing.